This spring there are so many changes at Reaching Our Community Food Pantry! First, one of our long-standing early spring fund raising events, Soup for the Soul, will not be held this year. Our volunteer coordinator for that event, Alex Apland, has so many things going on this year that she cannot commit to the event this spring. We completely support Alex’s decision, and she has promised to bring it back in 2019. Those of us who have watched this event progress understand the number of hours and hard work that go into a successful fund raising event and appreciate all the work Alex has done in the past. We look forward to this event’s return in 2019. Another change has to do with building improvements at the ROC. Our floor project is half done (the warehouse is done) and work will begin on the office space and waiting area right after Easter. The warehouse floor looks great, will be much easier to clean, and will serve us well into the future. On March 31, we will host our second annual Easter Egg Hunt at Reinhart Volunteer Park (All Sports Park) at the Harry and David Pavilion. We had so much fun last year when we did it on the ROC property, but it seemed to crowded that we decided to move it to the park. It will run from 1 pm until 3 pm. All are welcome. And then looking into the future, the annual Beardfest held the first weekend in October, sponsored by Tucker’s Barber Shop, will benefit the ROC this year. We are excited about the partnership with Tucker’s and appreciate this added fund raising event. We are so excited about all the events and all the fun we can offer to the community. Please join us whenever you can. New volunteers are always welcome. We have changed our Thursday distribution hours UNTIL FURTHER NOTICE. We will be open on Thursday from 1 PM until 5 PM, one hour less on Thursday. We have found that during the “dark” months, very few people come in between 5 PM and 6 PM. If you cannot make it before 5 PM, please consider coming in on Saturday from 9 AM until NOON. We need additional volunteers to help us with our Thanksgiving food gove aways on Thursday, November 16 from 12 Noon until 6 PM, and on Saturday, November 18 from 8 AM until 12 Noon. If you can help, please call the ROC at 541-476-3344 to volunteer. We have several projects that need to be completed, and can be done on weekday morning Tuesday through Saturday. We are repacking oats and rice, making healthy snack bags for kids, and working on rummage sale items for our Fall Festival. Any number of volunteers can come any time between 9 am and 2 on Tuesday and Wednesday, all day on Thursday, and 9 until noon on Friday and Saturday. Call the ROC at 541-476-3344 for more information. 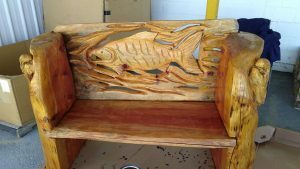 A bench carved by Mountain Man Joe, a chain saw carver, for our raffle at the Fall Festival. Volunteers are needed this summer as some of our regular volunteers head out for vacations and family events. This call is for former volunteers, part time volunteers, and even new volunteers. If you have never volunteered at the ROC, please come in before you intend to volunteer to fill out some paperwork and read over our Team Handbook. You will then get a tour of our facility, a description of volunteer opportunities, and suggested days for service. We do not assign volunteers…we let you pick the days and times you can work. Our greatest need is the distribution days of Thursday from 1 pm to 6 pm and Saturdays from 9 am until noon. If you have any questions, please call the ROC Food Pantry at (541) 476-3344. Thanks for your interest in our program.